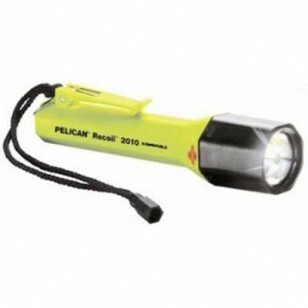 The SabreLite 2010 Recoil LED is among our best selling Pelican LED flashlights. Recoil LED Technology produces a focused beam unlike conventional LED flashlights. The LED flashlight is submersible to 500 feet and a twist on/off lens shroud eliminates accidental discharge. The Pelican LED Flashlight is powered by 3 C alkaline cells. The SabreLite 2010 is the future of LED Flashlights. Now available in Yellow with a lens ring that emits a bright glow in the dark. No more fumbling in the dark for your flashlight.